One thing that was easier is I was able to cook the bacon right in the instant pot with the saute function. When I make the slow cooker version, I have to dirty another pan to cook the bacon. I am SO GLAD we tried the instant pot version because it was ready SO FAST and we absolutely DEVOURED IT! It is a 3 way tie now for our favorite instant pot recipe, between this crack chicken, and my Mississippi Coke Roast and this Mongolian Beef. They are all SO GOOD! 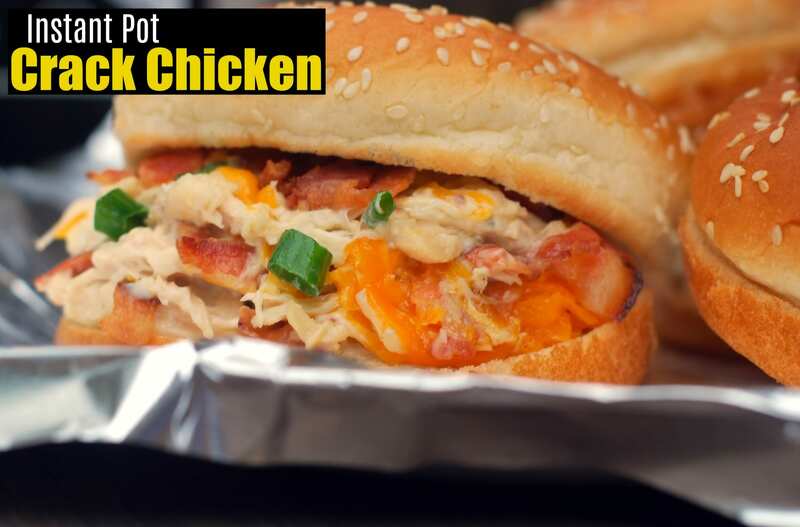 We served this crack chicken in sandwich form but it is also delicious over rice or egg noodles or even as a dip for crackers LOL! YUM! I hope you guys try it and love it as much as we DO! Hungry for more? Check out more of our favorite EASY Instant Pot Recipes for Beginners here! Turn instant pot to saute mode on high and once it says 'Hot', add diced bacon and cook until done. Turn the pot off and remove cooked bacon to a platter and drain off the bacon grease. Place chicken breasts and cream cheese in the instant pot. Pour chicken broth over the chicken. Sprinkle with ranch powder. Close the lid and make sure the valve is set to sealed. Cook on the manual setting on high pressure for 15 minutes. Let Natural Pressure release for 5 minutes and then do a quick release. Remove chicken to a bowl. Turn the instant pot back to saute mode and whisk the cream cheese so it can thicken. Shred the chicken and add it back in the pot along with the mayonnaise. Stir it until it is all combined and then top with the shredded cheese, reserved bacon and green onions. Serve in sandwiches, or on cooked rice or egg noodles. ENJOY! The recipe inspiration for the original Slow Cooker Crack Chicken came from the wonderful blogger over at Cookies and Cups. The instant pot version was adapted from Adventures of a Nurse and Cook Fast Eat Well. Go check out their AMAZING blogs! Nice information about Instant Pot Crack Chicken.. I like chicken .. Yummy and Delicious.. Thanks a lot..
WHY have I NOT made this yet?? I think these would be AWESOME for tailgate!! I’ve made this a few times and it’s great. I was wondering if there’s a way to make unless liquid at the end? We’ve been eating it on buns and it drips terribly. This was really good! Had it over rice. Whole family loved it. Was a little too runny for me at the end of the cooking process. Ended up thickening it with cornstarch. Thank you for sharing!